Modules from the Puppet Forge are a great resource. They simplify getting your systems managed under Puppet and save you from having to start from scratch in many cases. I have the utmost gratitude to the individuals who write or contribute to these modules. With that said, the people who contribute to them will sometimes introduce new features that diverge significantly from previous way, causing things to break. Because of this, in my lab environment I set most of the modules in my Puppetfile to ensure that the latest version is installed at all times, so that I can spot any potential any issues. DO NOT DO THIS IN A PRODUCTION ENVIRONMENT, HOWEVER! Prior to upgrading a version of a Forge module, you should review all of the release notes all the way back to the version you’re upgrading from. It should be also noted you should apply this level of caution to “Puppet Labs-supported” modules as well as those created by community members. One example I recently encountered was with the puppetlabs/puppetdb module. As noted in the change log, the latest version, 5.0.0, has the manage_pg_repo parameter set to true by default, so it will install a version of Postgres from the Postgres Yum repo, while the previous version, 4.3.0, had this off by default, and thus used CentOS’s Postgres package. A demonstration below in a Vagrant box running CentOS 6 shows the result of me blindly upgrading. 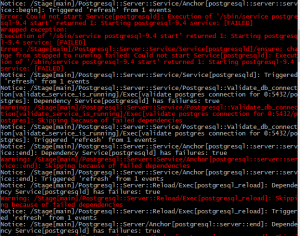 Issue a vagrant up and watch while it installs a PuppetDB server running on the OS’s Postgres package. Once complete vagrant ssh in and start up PuppetDB. It should be functioning properly. Now I’m going to break PuppetDB with the updated module. First, run sudo puppet module install puppetlabs/puppetdb –modulepath=/etc/puppet/modules, so that it installs the module inside the environment. Then run a sudo puppet apply /vagrant/manifests/default.pp to apply the manifest you created when provisioning the VM. Guess what? 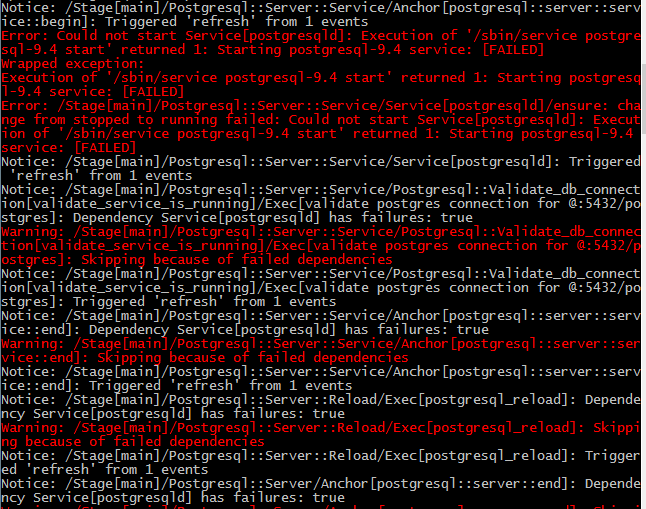 If this were a production system, you’re going to be fixing PuppetDB. The module installed Postgresql 9.4 alongside the OS’s 8.x Postgres, causing a conflict and preventing it from starting. It’s quite apparent that the individuals who put this in did not actually test for this scenario. They probably assume that everyone installing their module would be doing so with a clean system, which is often not the case. The lesson here: Puppet Forge modules are an excellent resource, but you should research and, if possible, test the changes made in the latest versions before upgrading your production environment. Otherwise, there’s always the possibility you may break something even more critical than PuppetDB.